Hard Rock Puerto Vallarta is known for the spectacular sunsets. This resort offers a great value while maintaining a true 5 star quality. Puerto Vallarta offers the best combination of golden sand beaches nestled against a rugged mountain backdrop. 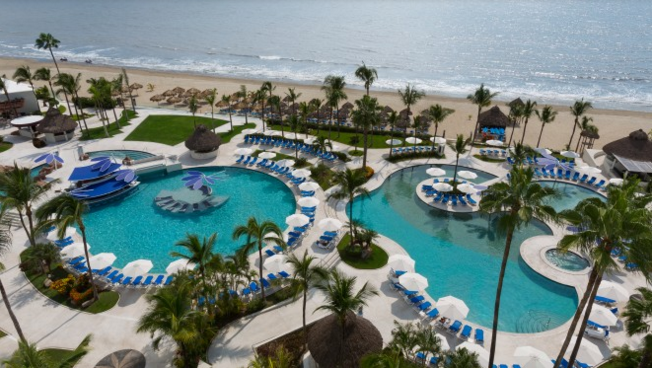 Hard Rock Hotel Vallarta offers the best combination of location, facilities, amenities and services suitable for an all-inclusive family vacation to Mexico. Explore the lifestyle of a rock n' roll star, with all the very best at your fingertips. Escape to the legendary beaches and azure waters of Bahia de Banderas in the heart of Riviera Nayarit, Mexico. Hard Rock Hotel Vallarta is a luxury, all-inclusive resort 20 minutes from the excitement of Nuevo Vallarta that indulges your senses. Feel your spirit soar as you experience a Nuevo Vallarta resort destination where you are free to relax, play, eat, love and explore. With a gorgeous beachfront setting, mesmerizing views, and a fusion of traditional and modern design, the Hard Rock Hotel Vallarta is the essence of coastal luxury and tranquility.